Birding in the Doon Valley is a world-class guidebook for northern India, covering Dehradun, Mussoorie, Asan, Rajaji NP, Deolsari, Dhanaulti & nearby areas. 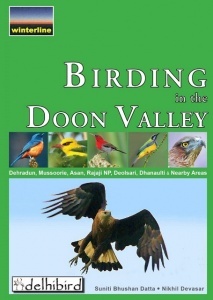 With 15 original colour-coded birding maps, a species guide to 200 regional bird species, 320+ colour photos of over 270 bird species plus landscapes, and a fully annotated regional bird list covering 504 species, Birding in the Doon Valley functions as a site guide, bird ID guide, driving guide and walking guide all in one. The Doon Valley is in a wide, geologically-rich gap between the Shivalik Hills and the Mussoorie Range of the lower Himalayas. The Doon Valley is a "microcosm" of the western Himalayas because of the wide range of habitats and steep altitudinal range, and contains three Important Bird Areas (IBAs), making it a birding hotspot. It is also an area of historical importance for ornithology, as it was the first Himalayan region to be conquered by the British Empire in 1816. As a consequence the first scientific efforts at formal, long-term, unrestricted ornithological study in any part of the Himalayas began in the Doon Valley. Paperback. 200 pages. 320+ colour photographs. 15 colour maps.